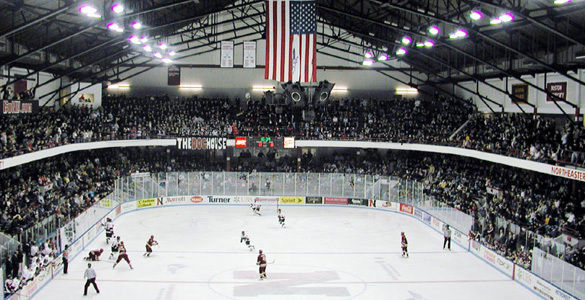 Northeastern University will host the University of Massachusetts Minutemen in the Quarterfinals of the Hockey East Tournament at Matthews Arena this weekend. The Minutemen advanced to the quarterfinals after defeating the University of Vermont in a three game series last weekend while the Huskies were on bye. Tickets for the series can be purchased HERE. Go watch the Huskies in their last Matthews Arena games of the season! Regular Season Stats: UMass finished eighth in Hockey East this season with 20 conference points and a record of 9 wins, 13 losses, and two ties. In conference play, their offense was the 8th-best in Hockey East, averaging 2.70 goals per game, while their defense was the third-worst, allowing 2.95 goals per game. They had the worst powerplay in the 24 conference games, clicking at a meager 15.5 percent rate, while their penalty kill was above-average, succeeding 80.8 percent of the time. Head-to-Head: UMass and Northeastern played twice this season, one game at each team’s home arena. Each time, the home team won in shutout fashion, with UMass winning the first tilt 3-0 behind 29 saves from Matt Murray, while Northeastern won the second game 5-0 behind 19 saves from Cayden Primeau. 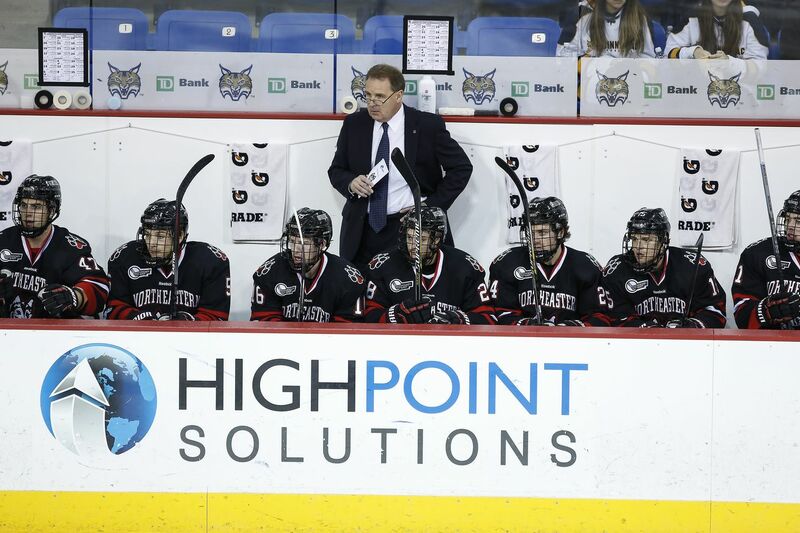 In their loss, Northeastern piled shots on net but were overall lackluster in their performance, including a whopping 38 penalty minutes, two 5-minute majors, and the powerplay going scoreless. 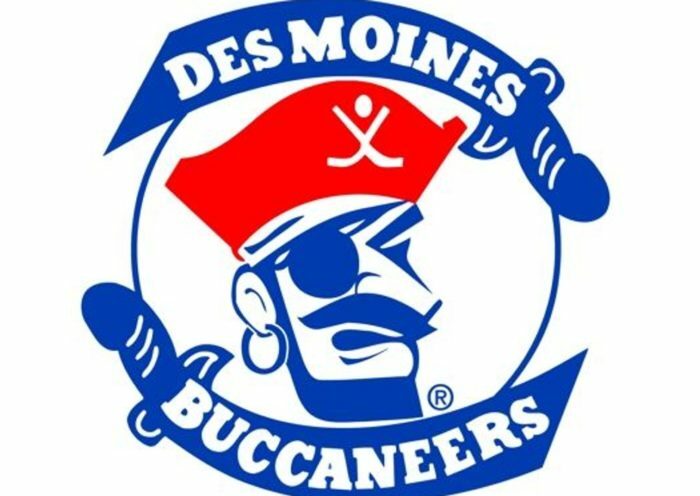 Their victory was highlighted by improved shot suppression even with Jeremy Davies suspended for the game, as well as a Nolan Stevens hat trick and impressive play by Brandon Schultz, Paddy Schule, and John Picking. You can read all my thoughts on that series HERE. Octo-Finals: While Northeastern scouted both opponents on their bye, UMass took on Vermont in the first round of the Hockey East Tournament. Both teams won one game, each in overtime, before UMass walked away with a decisive, convincing 5-1 victory in Game Three. The series was not without a price for the Minutemen, as goaltender Matt Murray, the man who shut out Northeastern this year and started the first two games for UMass this series, was injured in Game Two. 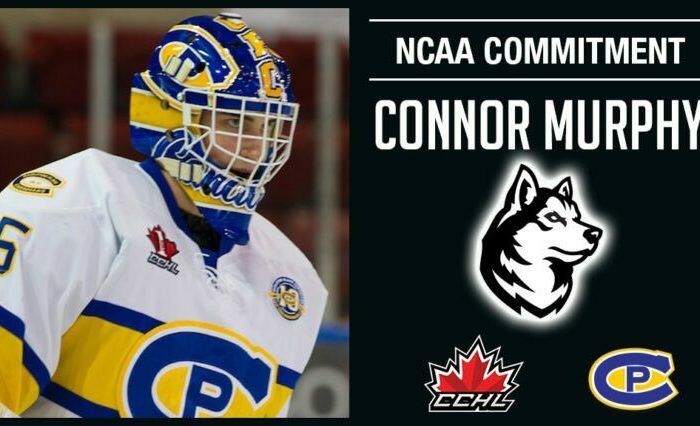 Sophomore Ryan Wischow made 30 saves in his Game Three start, giving coach Greg Carvel a steady option if Murray cannot suit up against the Huskies. UMass was led in scoring by John Leonard’s 4 points in 3 games (2-2-4), while Austin Albrecht had two goals, and Jake Gaudet had three points. In total, 15 different players for UMass registered a point, and 9 different players scored a goal, including two defensemen. 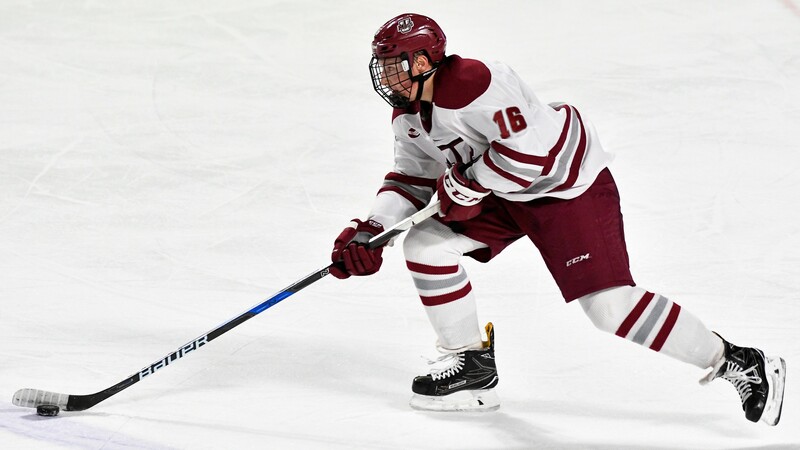 This well-balanced scoring attack proves that UMass has the skill and ability to score at any time in the game, regardless of who is on the ice. I had a chance to speak with Fear the Triangle, both the godfather of Hockey East blogs as well as a die-hard UMass fan. We had a short Q & A related to this series, the recent play of UMass, and his thoughts on the series going forward. NUHB: In our DM conversations, you talk about the team playing with confidence. What has been the biggest change in UMass’ play since NU split with them last month? FTT: They played Northeastern right in the middle of a really tough scheduling stretch. They had to play at Vermont January 12th and 13th, then travel to Orono for the 16th, and then return home to play the Huskies in Amherst on the 19th before heading to Matthews the next night. They did OK, picking up a win and tie against UVM and the 3-0 shutout at home against the Huskies, but playing three games a week with some long road trips took its toll. In all they played 13 games from January 12th through February 10th. That’s a tough schedule for any Hockey East team, much less one with 19 underclassmen. The 5-0 loss at Matthews on the 20th was the start of a six game losing streak. Once they were able to get back to playing one or two games a week in mid-February and got proper rest they started looking much better and were able to upset Lowell and Providence to get momentum heading into the playoffs. NUHB: What were the biggest factors that gave them the win against Vermont? And what happened that caused a Game 2 loss? FTT: Early on Friday they had a lot of issues turning the puck over in their own zone which was limiting their chances and also took a number of bad penalties. That helped Vermont get out to the 2-0 lead during the 2nd. But a cheap shot spearing by Jarrid Privitera on Cale Makar after the whistle near the end of the period ended up being a turning point. The team itself really rallied after that and John Leonard scored early in the 3rd during the 5 minute power play resulting from the spear. The refs called a much tighter game after the Privitera penalty and UMass capitalized again to tie the game on a highlight coast to coast by Makar. Overtime was played pretty evenly but UMass pulled out the win. Unfortunately I had to head home and deal with some Nor’easter issues at my house on Friday and missed Game 2, but from what I can tell from the box score and conversations with those who attended is that the problems from early in Game 1, turnovers in their own end and penalties, were issues again on Friday. Goaltender Matt Murrary reportedly was injured mid-game but continued to play the rest of the game. However the injury probably was a hindrance for him as it sounds like the Catamount game-winner in overtime was probably one he should’ve stopped. NUHB: What does the goalie situation look like? It appears Wischow played better tonight than Murray did the first two games. FTT: We may not know who will start Friday until the lines come out. I personally have confidence in both of them. Matt Murray probably has a little more upside and is more athletic and the coaching staff thought he was the best goalie to have in net for most of the 2nd half of the season. At the same time Ryan Wischow is very professional and given how well he played in the 5-1 win on Sunday you’d never know it was only his third start in the last couple months. A lot will depend on Murray’s health but I don’t think it will make a material difference in the team’s chances against Northeastern with either in net. Many thanks to FTT for taking the time out of his schedule to answer our questions. FTT was one of the inspirations for starting this blog, and unfortunately he ended his blog coverage of UMass right as we started our coverage of Northeastern. His website and formatting was one of the main models we based ours off.